← It is never too late to learn English! What do you hear when you say g? A gentle giant named Tim! A goose with a great gray coat! Here are some ideas to enhance your alphabet instruction. Precut two gingerbread people shapes from brown paper bags. Give two to each child. Staple the shapes together around the edges leaving a space unstapled so children can stuff their person. Provide children with sequins, glitter, markers, paint, buttons, or pieces of cloth so they can decorate their people, giving them faces, clothing, and so on. 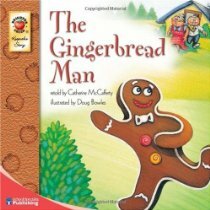 Follow up by reading The Gingerbread Man by Catherine Mc Cafferty or Gingerbread Friends by Jan Brett. Then use this recipe make gingerbread cookies for a snack. Use a ghost-shaped cookie cutter to cut shapes out of whole wheat bread. Spread each shape with cream cheese. Use mini chocolate chips to add eyes and a mouth. Yum! On a grassy area outdoors, dig a hole deep enough to hold a coffee can. Place an empty coffee can in the hole, level with the grass. Give children toy golf clubs and a small rubber ball or a plastic golf ball. Let children try to sink the ball into the can. Note: If you are unable to dig a hole, try placing the can on its side on the ground. Children can practice getting the ball into the can. Provide children with samplings of green, red, and purple grapes. Let children taste each kind and decide which they like best. Then create a “Grape Graph” that shows the results of children’s decisions. Ask more-or-less questions about the students’ graph. For example: Did more students like green, red, or purple grapes? Which grape did the fewest students like? Cut out shapes of the letter G from green sponges. Give one to each child. Wet sponges well and place them in pie plates. Invite children to sprinkle grass seed onto their sponges. Place in a sunny spot and keep sponges moist. Children will love seeing their green, grassy sponges grow! Explain to children that gravity is a force that pulls things down toward Earth. We depend on gravity to hold so many things down — cars, people, furniture, pencils, and papers on your desk, and so on. If there was no gravity, everything not stuck in place would suddenly have no reason to stay down; it would start floating. After explaining gravity, hide around the classroom a variety of items whose names begin with the g sound — for example, gloves, a golf ball or golf club, a gold coin, a glass, a gift box, a globe, stuffed toy animals such as a goat or a goldfish or a gorilla, a grapefruit, a graduation cap, a guitar, or a gumdrop. Let children search for the items. When items are found, encourage children to drop each one (that is not breakable) to see gravity in action. YOUR WORD CORNER Here are some words you will need. See them, say them … hey, you can read!! Write the words on a chart and review them. Then read aloud each sentence that appears below. Try each word in each sentence. Let children tell you which word fits. 1. I have a gift to ______________you. 2. The cake was so ______________! 3. Where are you ________________? Posted on September 22, 2012 by paulalyra	• This entry was posted in Videos. Bookmark the permalink. of volunteers and starting a new initiative in a commumity in tthe same niche. Your blog provided us valuable information tto work on. You have done a wonderful job!